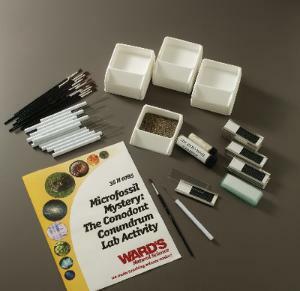 Teach your students about the role of a forensic geologist as they study the concepts of biostratigraphy, index fossils, applied geology, and problem-solving. They will first examine and identify the microscopic fossilized remains in a Devonian limestone. As they identify the unusual extinct marine animals called conodonts, they will be able to characterize specific biozones and determine important biostratigraphic relationships. Then they’ll be asked to solve a simulated real-world problem using the evidence they have uncovered. You will receive enough materials for a class of 30, a teacher’s guide, and student copymasters. A stereomicroscope, required, is available separately.